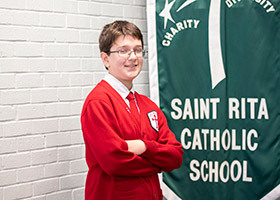 FORT WORTH — A well-rounded student at St. Rita Catholic School in Fort Worth, Phillip Socha is a top scholar who enjoys a myriad of extracurricular activities from sports to robotics. The 13-year-old seventh-grader also has a penchant for service, such as mowing the lawn for Sister Kay Jo Evelo, SHSp, an instructor at St. Rita. The principal said her school, founded in 1954, serves 148 students in grades pre-K (ages 3+) through eighth grade in a nurturing and diverse background. Located in east Fort Worth, the school has 14 teachers and a staff of 25, with more than 230 years combined experience in encouraging students to reach their full potential academically, spiritually, physically, and socially. Phillip, the son of Jerome and Maria, comes by his interest in robotics through his father, who is an aerospace engineer at Lockheed Martin and is also the school’s volunteer robotics coach. Phillip participates in variety of sports, including basketball (his father is a volunteer coach), football, and volleyball. He also plays the snare drum in the school band. The teenager is a member of Fort Worth-based Cub Scout Pack 180. Phillip and his brother, Gabriel, a sophomore at Nolan High School, enjoy mowing Sr. Evelo’s lawn, which she repays by contributing to the Scouts. Despite his many extracurricular activities, Phillip said he finds time to play video games. “When I finish my homework, I play,” he quickly added. That homework-first approach probably helped him become a Duke TIP scholar. The Duke University Talent Identification Program is a nonprofit organization that has served academically talented students in grades 4 through 12 since it was founded in 1980. Collaborating with educators and parents, TIP helps gifted students assess the extent of their academic abilities. 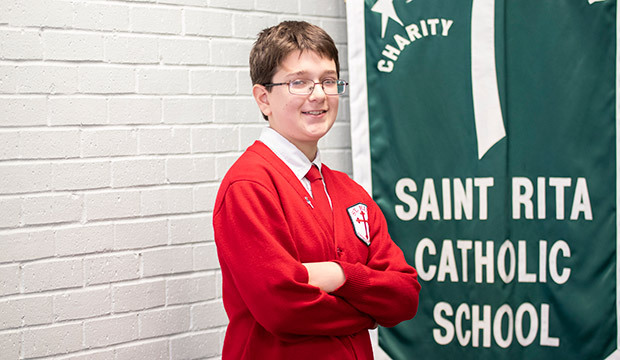 Faith is an important part of Phillip’s life, and he assists as an altar server at St. Rita. “My faith is really important to me because I know God is there and I can pray to Him,” Socha said.